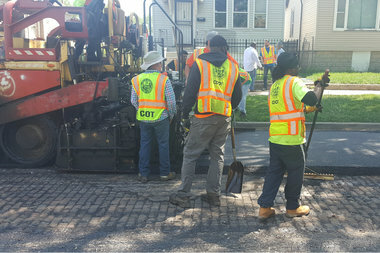 Department of Transportation workers repave the street in the 8300 block of South Kerfoot Avenue in Auburn Gresham on Monday. It's possible the material under the pavement is a "wood-paved street," according to the Chicago History Museum. Pavers were phased out around 1910, but many streets were just paved over, and the pavers weren’t necessarily removed. There’s probably a lot of wooden paving out there still. CHICAGO — Repaving Chicago's streets sometimes means unearthing some of the city's history. Crews paving a street on the 8300 block of South Kerfoot Avenue Monday might not have been aware of the century-old street they were standing on as a new layer of road was created. It's likely the older surface was a wood-paved street, which the city used from the 1840s until 1910, according to John Russick, the Chicago History Museum's vice president for interpretation and education. "There's probably a lot of wooden paving out there still" all over the city, Russick said. 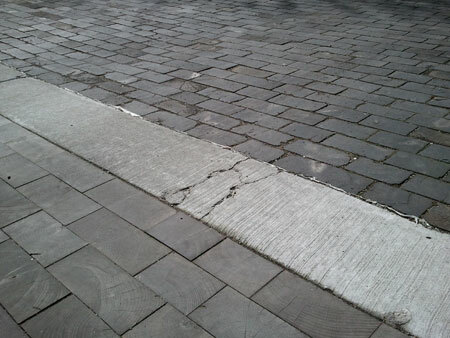 Many of those streets were just paved over, and the wooden paving wasn't removed, he said. "It didn't pay to pull all that stuff up unless the road was completely ripped apart," Russick said. "So much of history is just laying there for us to recover." According to Chicago History Museum, Chicago in 1855-56 became the first western city to adopt the Nicolson Paving System, which featured "checkerboards of cedar wood blocks soaked in creosote and set into tar and gavel laid on a foundation of planks treated with hot tar." By 1891, more than half of Chicago's streets were paved in wood. The streets were considered a tourist attraction and were preferred over cobblestones because "they were quieter and easier on the feet of both people and animals." The city is starting its street paving projects earlier this year due to a mild winter, officials said Monday.